General Anthony Wayne was one of the great American heroes of the Revolution. Famed for his aggressive style of fighting, he came to be called “Mad” Anthony. In what probably is the most famous incident of his career, he stormed and overran the British fortifications at Stony Point, New York, personally leading a bayonets-only attack. After the Revolution ended he served his country again during the Northwest Indian War. This conflict pitted the newly independent United States against a confederacy of western Indian tribes determined to defend their homelands. 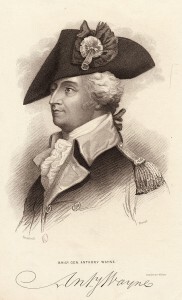 American forces suffered a long series of defeats until General Wayne took command. In 1794 at the Battle of Fallen Timbers, he defeated the confederacy and in 1795 negotiated the Treaty of Greenville in which the Indians ceded most of what is now Ohio to the United States. Mad Anthony Wayne didn’t have long to enjoy his victory. He died in 1796 while traveling back east from the scene of his recent military and diplomatic triumphs. He was buried near Erie, Pennsylvania, a long way from his home in the southeastern part of the state. Some years later his family decided to bring his remains back to Radnor, Pennsylvania, for reburial, a decision that was to have some dramatic and unforeseen consequences. Upon opening the General’s grave, the excavators did not discover the skeleton they expected. Although more than ten years had passed since his burial, Mad Anthony’s corpse turned out to be in remarkably good shape. Faced with the problem of transporting a decaying but still largely intact corpse, the excavators decided to scrape and boil away the flesh, and reduce the General to a bundle of relatively clean bones. What was left over supposedly got poured back into his original grave (with the exception of a few souvenirs taken by bystanders). The bones were then transported back to a church in Radnor for reburial. The story doesn’t end there, though. There is a strong oral tradition in Pennsylvania that all of Mad Anthony’s bones did not make it back home. As the story goes, the bones had not been properly packed, and many of them were lost on the long overland trek from Erie to Radnor. This circumstance gave rise to one of the best ghost stories about a Revolutionary War hero. Every year on January 1, the General’s birthday, Mad Anthony Wayne goes out searching for his lost bones. His ghost rides along U.S. Route 322 in Pennsylvania, a road that follows the path along which the bones were scattered, and seeks to recover them. Understandably, the General is mad that he is buried in Erie, in Radnor, and at several locations in-between.